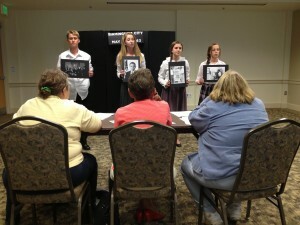 Here’s how Kids in Birmingham 1963 storytellers bring history alive. 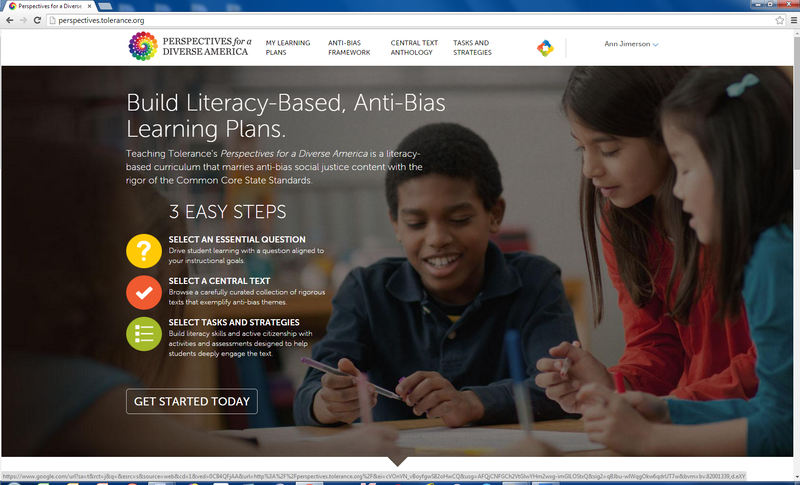 New anti-bias curriculum. 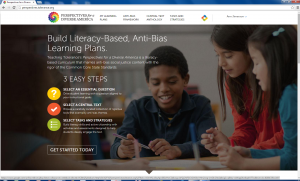 As Teaching Tolerance, a project of the Southern Poverty Law Center, planned its “Perspectives for a Diverse America: A K-12 Literacy-based Anti-bias Curriculum,” they discovered the Kids in Birmingham 1963 collection. 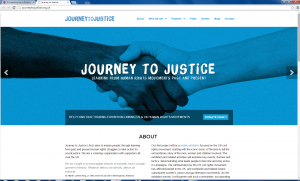 They invited five Kids storytellers to include their stories as central texts that exemplify anti-bias themes. 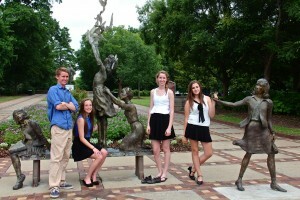 Director Maureen Costello wrote to Kids, “The first-person stories on your site are exactly the kinds of texts we’ve been seeking. They’re short enough for classroom use; they resonate around all the issues we identify; and, of course, they reflect the experience of everyday young people. That’s a winning combination.” More than 6,000 people have registered to use the free curriculum, available here: http://perspectives.tolerance.org/. Teacher institute. 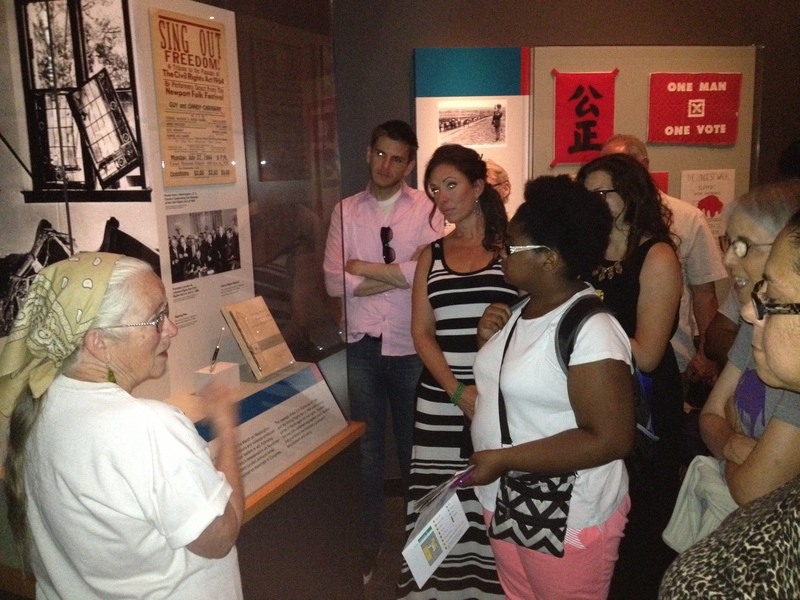 As the Library of Congress in Washington, DC, prepared for its summer 2014 Civil Rights Institute for teachers from across the U.S., Meg Steele in Educational Outreach invited storyteller Ann Jimerson to lead the teachers through a Smithsonian exhibit on civil rights history. Ann and civil rights activist Joan Mulholland brought the history to life, pausing in front of a display of shards of stained glass from the 1963 bombing of Birmingham’s Sixteenth Street Baptist Church. When she was 12 years old, Ann’s father, a white civil rights worker, had stooped to pick up shattered glass just hours after it was blown from the church windows. The Jimersons and Joan Mulholland have donated the glass to the new National Museum of African American History and Culture, due to open in 2016. Kids in Birmingham 1963’s creative Lesson Plan. 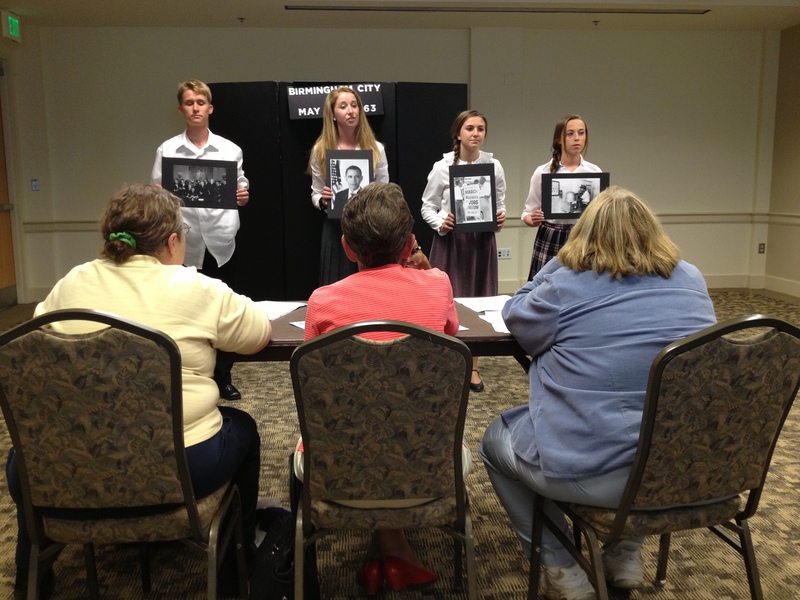 Inspired by the stories on the website, teachers Beth Jimerson and Casey Kelly created a lesson plan to honor the young women killed in the 1963 bombing of Sixteenth Street Baptist Church. 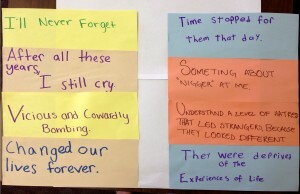 With her high school students, Ms. Kelly tested the lesson, which has students work in groups to create a found poem in response to reading primary source stories related to that event. Click here to see the lesson plan, complete with handouts, PowerPoint slides to introduce the historical facts, complete instructions, and a rubric to aid students in assessing their work. 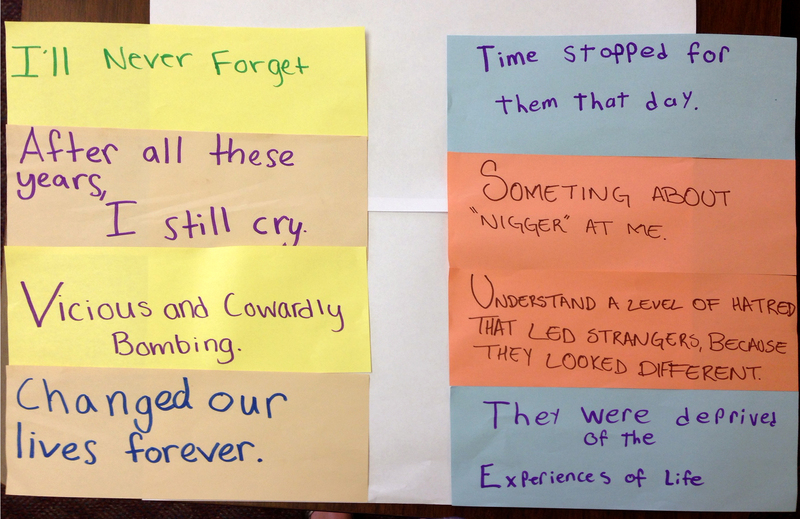 Found poems created by groups of students from text of Kids in Birmingham 1963 stories. Photo by Casey Kelly. Study tour to Birmingham. 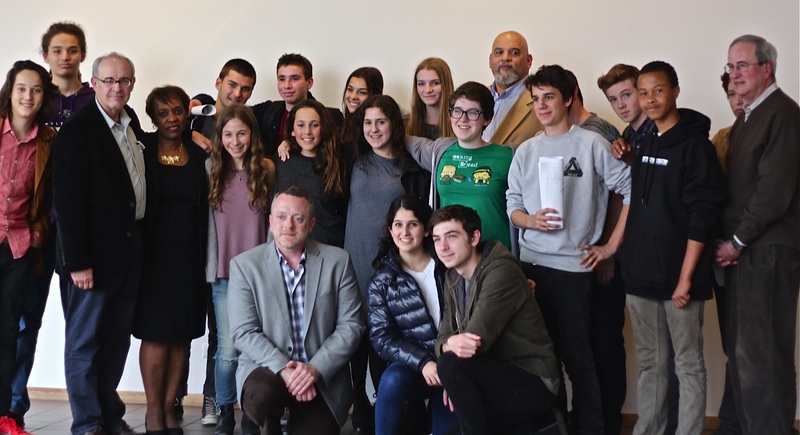 Ninth and tenth graders from Oakwood Secondary School in North Hollywood, CA, in a 2014 spring-break immersion course called “Freedom Fighters, Young and Unsung: A Civil Rights Road Trip,” met history head on during their stop in Birmingham. They were hosted by Kids in Birmingham 1963 storytellers Carl Carter, Robert Corley, Jeff Drew, Virginia Jones, and Janice Wesley Kelsey, who shared their youthful experiences of a turbulent time. 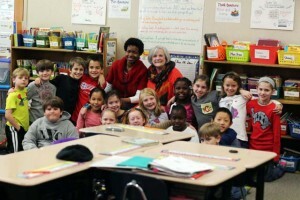 The Birmingham crew was impressed with the young people’s thoughtful questions. National History Day, Pennsylvania state winners. The Philadelphia team of high school students, Carmen Li, Kevin Liu, and Kevin Yang, won their state level National History Day contest, advancing to the 2014 nationals. 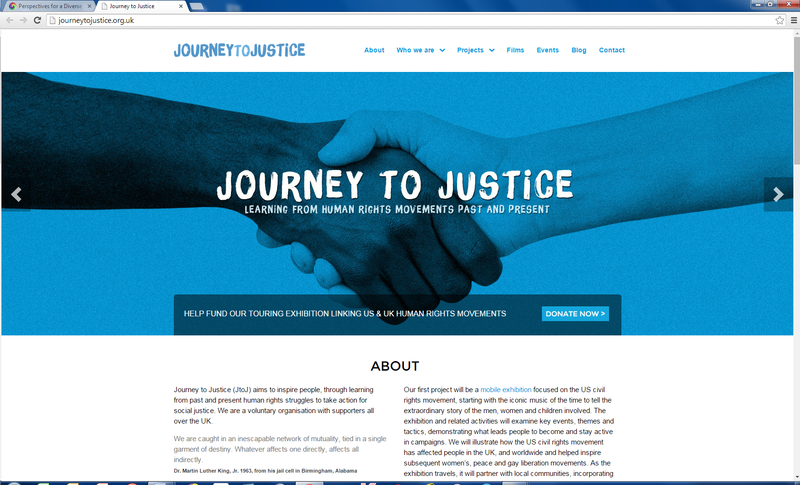 See their impressive website, “Confronting Bombingham” at: http://56168191.nhd.weebly.com/. The students interviewed Kids storytellers Deborah J. Walker and Dale Long, whose personal accounts added depth to the project. 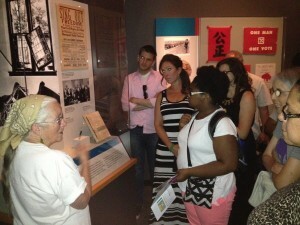 Primary sources for classroom. 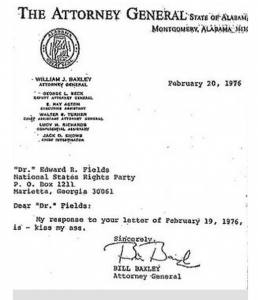 Maryland high school teacher Anne Manuel was inspired by a link she saw on the Kids in Birmingham 1963 Facebook page about a brief but provocative letter from Bill Baxley, Alabama’s Attorney General. During his 1976 attempt to prosecute the Klan members responsible for the 1963 bombing of the Sixteenth Street Baptist Church, Baxley had written in response to a hate-filled letter from the Ku Klux Klan. Ms. Manuel asked Kids how she might locate the Klan’s letter. She wanted to pair the letters for a discussion on hate speech, part of her unit on civil rights. 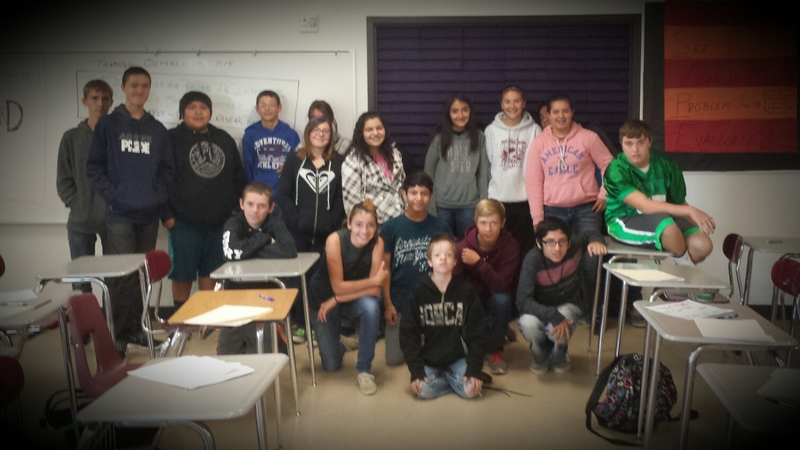 Kids tracked down Mr. Baxley, who made the letter available for Ms. Manuel’s class. PhD thesis. Gisell Jeter, a History PhD candidate at Ohio State University, is developing her thesis on “We’re Going Too: The Children of the Birmingham Civil Rights Movement.” In 2014, she interviewed seven of the Kids in Birmingham 1963 storytellers as she explored the question: What did it mean to come of age as an African American child in Birmingham, Alabama, at the height of the civil rights movement? Commemoration in NYC. Watching in horror as Birmingham’s firemen turned high pressure hoses on children in 1963, the New York City Fire Officers Association issued a resolution declaring, “This shameful and deplorable conduct by the City of Birmingham . . . has brought discredit to the honorable status of professional firefighters.” In May 2014, US Congresswoman Carolyn Maloney, the FDNY Uniformed Fire Officers Association, and the First Lady of New York City worked through Kids in Birmingham 1963 to invite Janice Wesley Kelsey and Gwendolyn Gamble to travel from Birmingham to New York to take part in an event commemorating FDNY’s historic stand. Seminar on resilience. 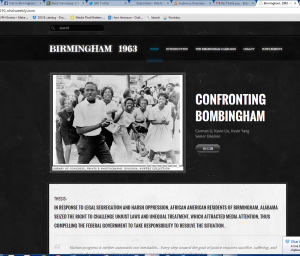 Virginia-based staff of the American Psychiatric Association’s Office of Minority and National Affairs was preparing for a November 2013 event they would hold in Birmingham, “Transcendence and Resilience Following Trauma, Celebrating the Triumph of the Human Spirit: The 50th Anniversary of the Sixteenth Street Baptist Church Bombing.” Through Kids in Birmingham 1963, they invited storyteller Jeff Drew to tell participants about growing up as an African American child in the neighborhood nicknamed “Dynamite Hill” for the frequent bombings there.